In addition to your intensive Japanese language courses every morning, KCJS offers a variety of academically rigorous subject courses that are scheduled in the afternoon hours. Each student selects two courses per semester (four points of academic credit per course), which will either meet twice a week for 90 minutes each, or once a week for three hours. For more information, see list of current and recent courses and accompanying syllabi. The Kyoto Consortium for Japanese Studies (KCJS) is excited to announce a new initiative that will allow a limited number of its students to cross register for certain elective subject courses offered by the Associated Kyoto Program (AKP) during the academic year. In turn, a similar number of AKP students will be allowed to enroll in selected KCJS elective courses. This option will commence on a trial basis during the Spring 2019 Semester. KCJS and AKP have decided to take advantage of their adjacent locations on the Doshisha University campus to share their faculty expertise in Japanese Studies for the benefit of students who have a particular area of academic interest they want to pursue, or a specific graduation requirement they need to fulfill during their period of study in Kyoto. Grades for these AKP courses will be posted on the KCJS Grade Report. Each program office has established its own procedures for soliciting interest among its own students, and for granting its students permission to cross register. Detailed information on eligible AKP elective courses and the cross-registration application procedure will be provided in October to KCJS students who are enrolled in the 2018-2019 academic year or Spring 2019 semester programs. In many of your subject classes in the afternoon, there will also be course-related field trips that are designed to deepen your understanding of the topics introduced in the readings. Such trips may include some on-site, self-directed exploration, together with guidance from your professor and/or Japanese staff on the premises. 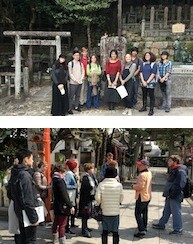 These trips provide excellent opportunities for you to learn about a particular subject in Japanese. For a list of recent course-related field trips, click here. If you enroll for a full year or for the spring semester at KCJS, then, you may apply to undertake an independent study in the spring. Typically you would undertake this project in lieu of one of the two regular subject courses. Through the independent study, you can explore a specific research topic in-depth, and acquire the methodological and analytical skills necessary for academic research. Many students who plan to write a senior honors thesis at their home institutions have taken advantage of these independent studies as opportunities to collect materials or data that they might otherwise not have access to in the United States. Moreover, you may be able to establish an invaluable network of scholars and experts in your field of interest through an appropriate advisor for your independent study (either the Resident Director or a local faculty member from a university in the Kansai area). Click here for a sample list of previous independent study project titles. “One significant opportunity KCJS provided me was the chance to do independent linguistic research on Japanese for credit. KCJS helped set me up with a Japanese graduate student who acted as a tutor and mentor and helped guide my research. In my senior year of college, after I had returned to the U.S., I did a series of linguistic experiments with Japanese participants and got some interesting and novel findings, which were presented at a major conference this year. I am currently working full time as a linguistics research assistant, and one of the projects I’m working on concerns speech perception in Japanese listeners. I am also working independently on a project whose goal is to create computer-based feedback tools to help native Japanese speakers improve their English pronunciation. The language classes I had at KCJS, and the opportunity to be immersed in the language, spurred my interest in Japanese linguistics and have enabled my research to date. Every summer KCJS offers a small number of grants which are intended to give students a chance to put their Japanese language skills to use in pursuing a serious independent research project, typically in preparation for a senior thesis or honors thesis. Students who undertake these projects should be in regular contact with their advisor at their home institution regarding the design and shape of the project to ensure continuity upon their return to campus in the fall. Each grant provides a maximum stipend of ¥350,000 for a ten-week period of research to be conducted in Japan. The 10-week grant is paid in two installments, with the second installment conditional upon submission of a satisfactory mid-term progress report. Awardees will also receive an additional payment of US$500 upon submission and approval of a final detailed report or research paper following completion of the grant period. (Proposals for five-week summer grants, in proportionally smaller amounts, will also be considered.) The fundamental goal is to enable you to make good use of your Japanese language skills over the summer, while also advancing your educational goals in the United States. All full-year or spring-only KCJS students are eligible to apply for the summer research grants. The proposed research can be of any kind and in any discipline, but it must have an ultimate purpose in mind. Most grants are awarded for research towards a senior thesis or honors thesis, but other possibilities include submission to a student journal at your home institution. The key requirement is that you indicate some concrete way in which you plan to publicize the results of your research to a wider audience, whether through a publication (either in print or on the Internet), or through some other forum. It is also essential that you make full use of Japanese-language resources. KCJS summer research grants are meant for full-time research during the period of the grant. Normally, a grantee may not hold a second grant, regular job or internship coterminous with the KCJS grant. However, exceptions may be permissible on a case-by-case basis with the advance, written permission of the KCJS Director.